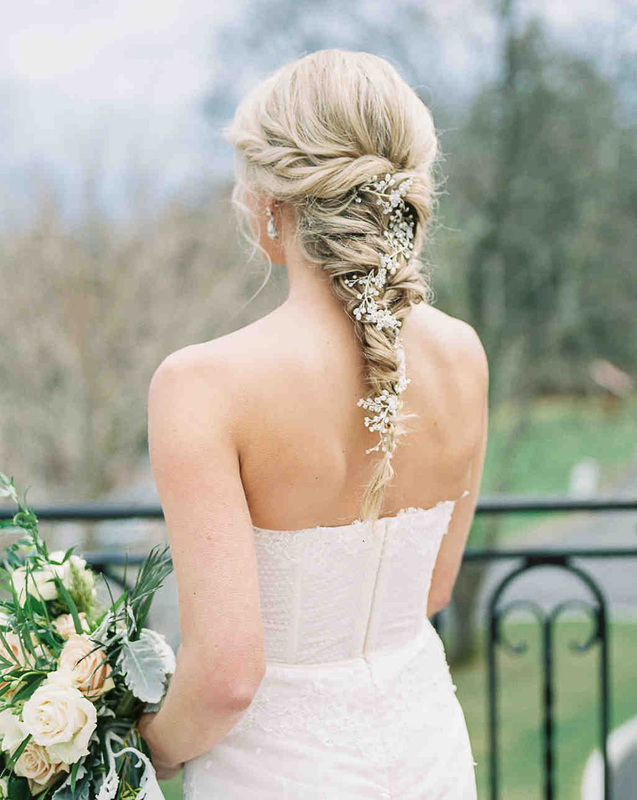 Choosing your wedding hairstyle can feel a lot like putting the finishing touch on your overall bridal beauty look. In reality, though, your hairstyle is just as important as all of those other elements. That's why you should give it the thought it deserves. If you're looking for a way to make the hairstyle you're considering feel extra special, it's time to consider fresh floral accents. 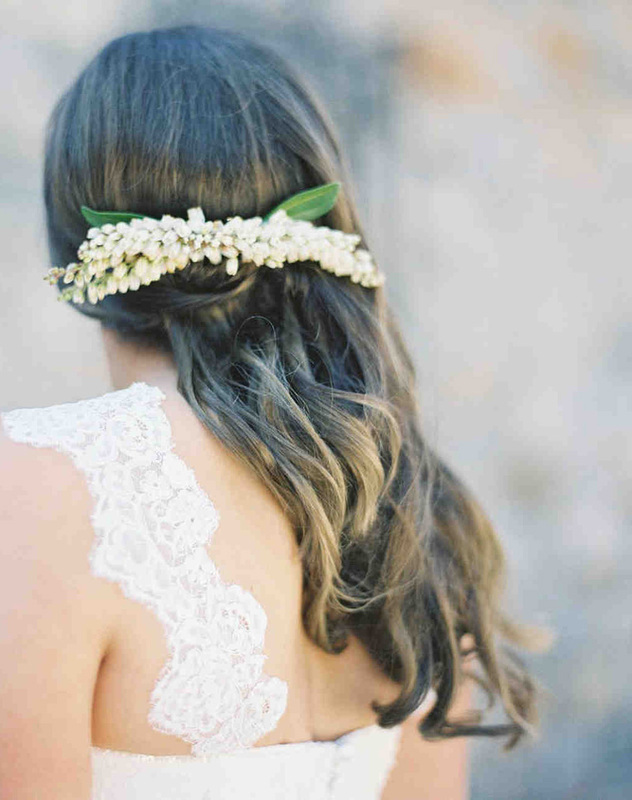 No, we're not talking about flower crowns (although those are pretty, too). 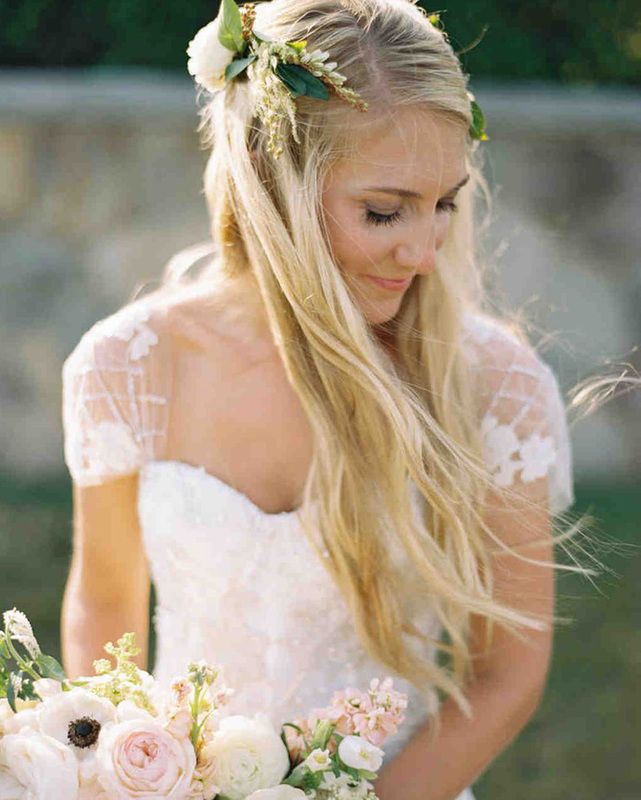 If you're not the type of bride who wants to wear a full headpiece of blooms, know that you don't have to. You can add as few or as many of your favorite flowers to your hairstyle as you want, lending just the right hint of color, texture, and freshness to your look. 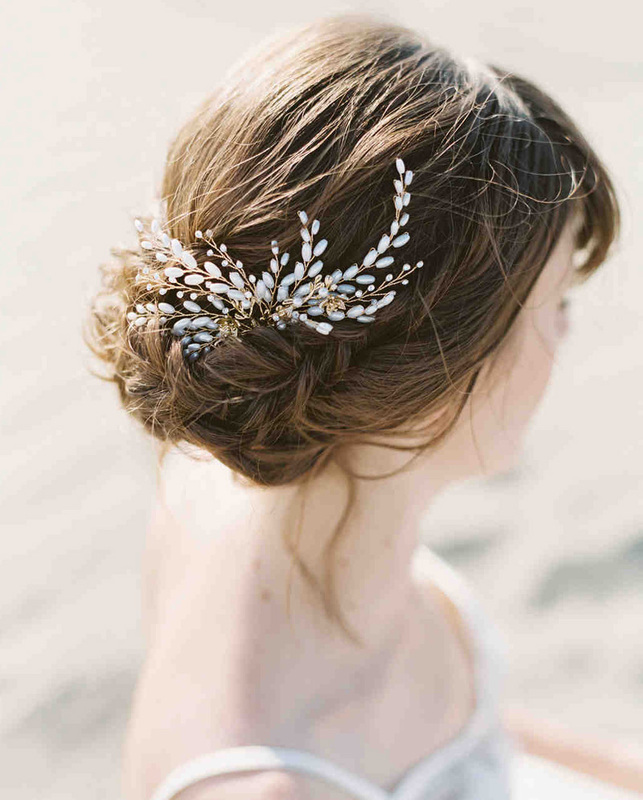 Just take the following hairstyles, worn by brides at their real-life celebrations, for example. They not only prove that florals take your locks to new heights, but also affirm that there's a way to incorporate buds into any type of style. Wearing your hair loose and wavy? Loop in a lightweight sprig to tuck up one side. 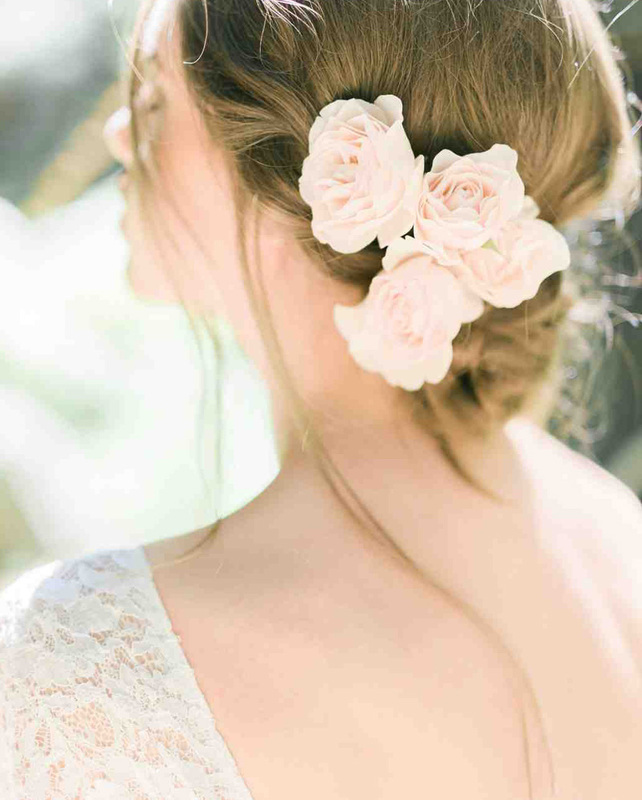 If you've settled on a classic updo, adding two or three creamy roses above a chignon or low bun is the way to go. As for a braided look, consider working anything from baby's breath to andromeda into your plaited style. 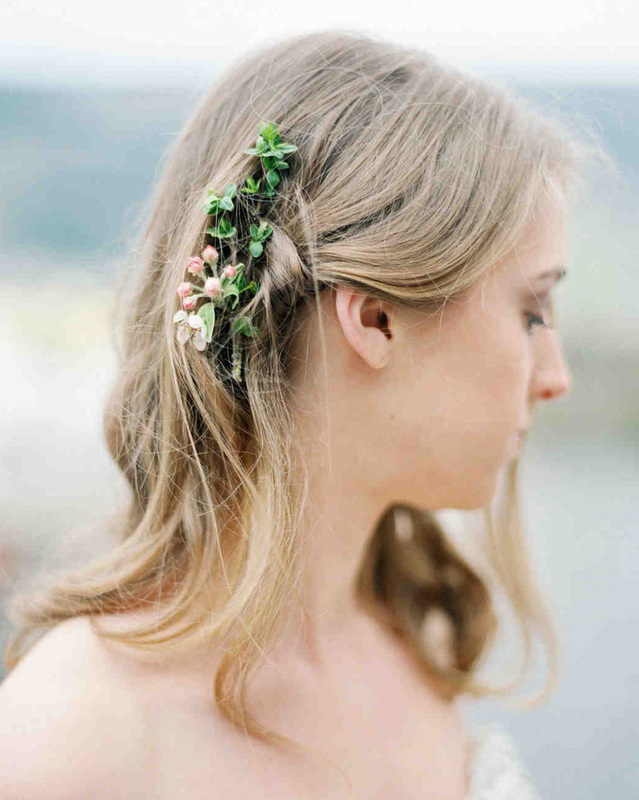 Not all floral hairstyles, of course, involve fresh buds. 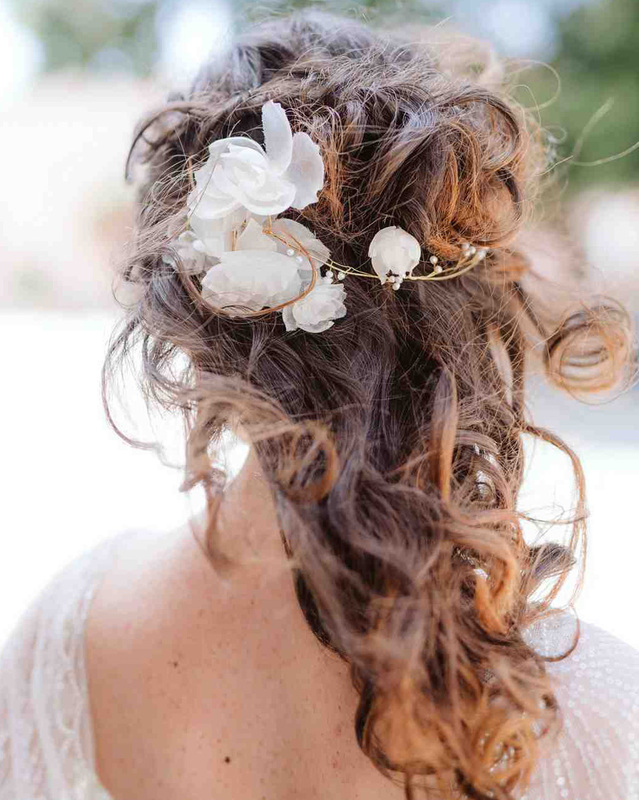 If you're searching for a hairpiece that's a little more durable—and one that is going to stay put as you dance the night away—opt for silk, metal, or crystal varieties. Ready to see all of these inspiring styles for yourself? 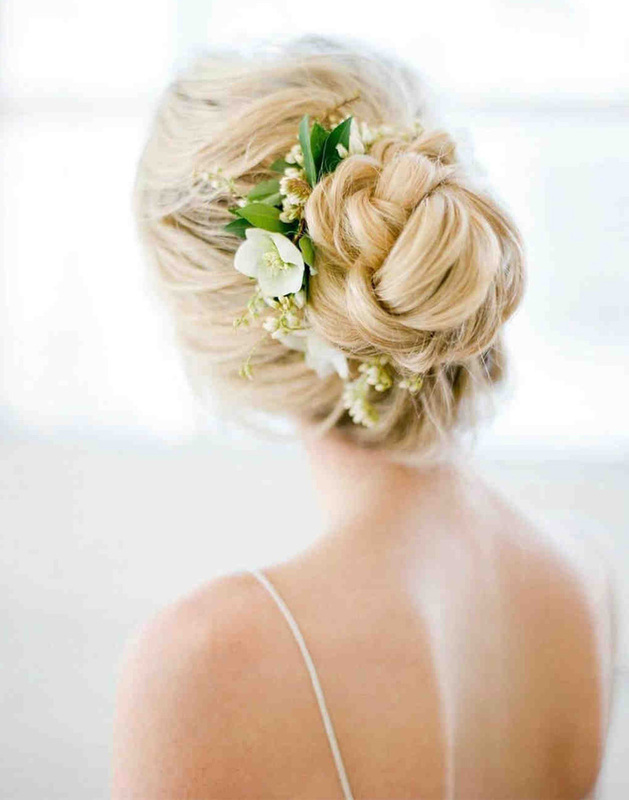 Click through to discover your perfect wedding hairstyle. 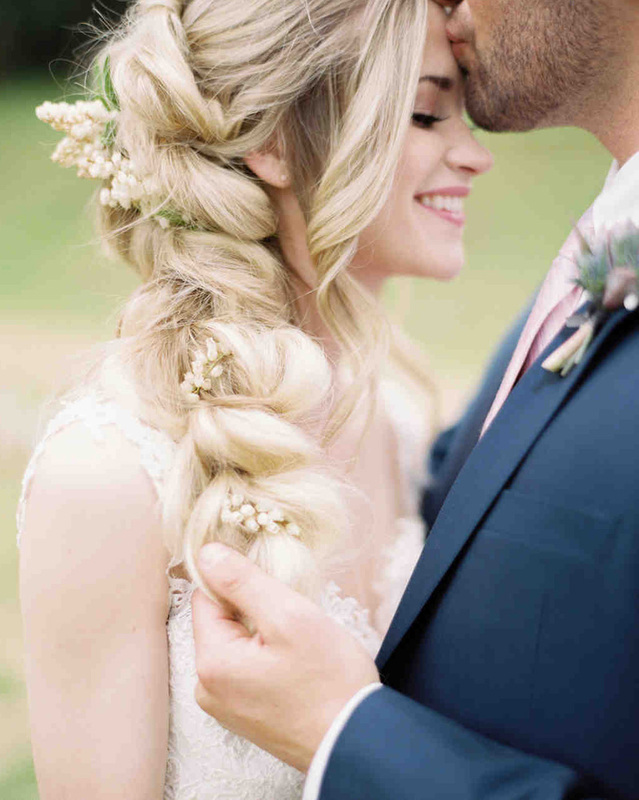 A burst of peachy roses dressed up this bride's under-braid updo while a few sprigs of strategically-placed baby's breath completed the look. Small white blooms, andromeda buds, and leafy greens created a "scrunchie" effect around this bride's bun by Chiali Meng Artistry. 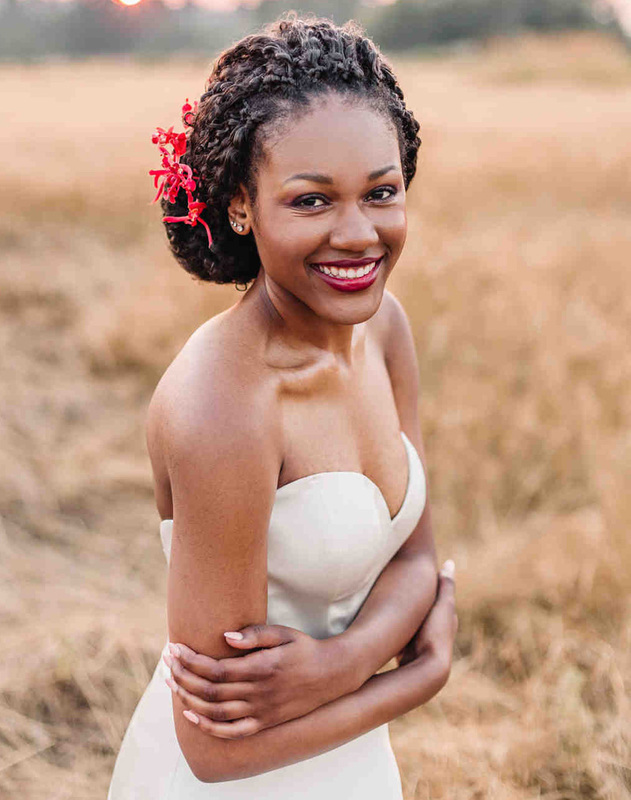 Andrea Hair Stylist used a piece of looped hair to keep this minimal sprig in place. Three bold blooms added some fresh volume to this beauty's classic-meets-messy chignon. 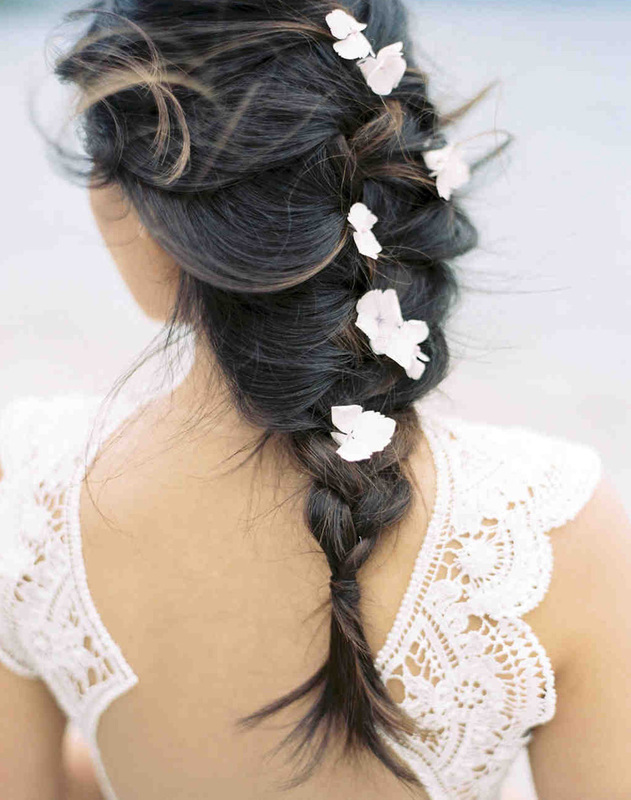 A trail of all-white flowers made this loose braid by The Pretty Parlour even softer and infinitely more romantic. We loved how this metallic vine (the "buds" are actually crystals!) followed the terrain of this tucked updo. 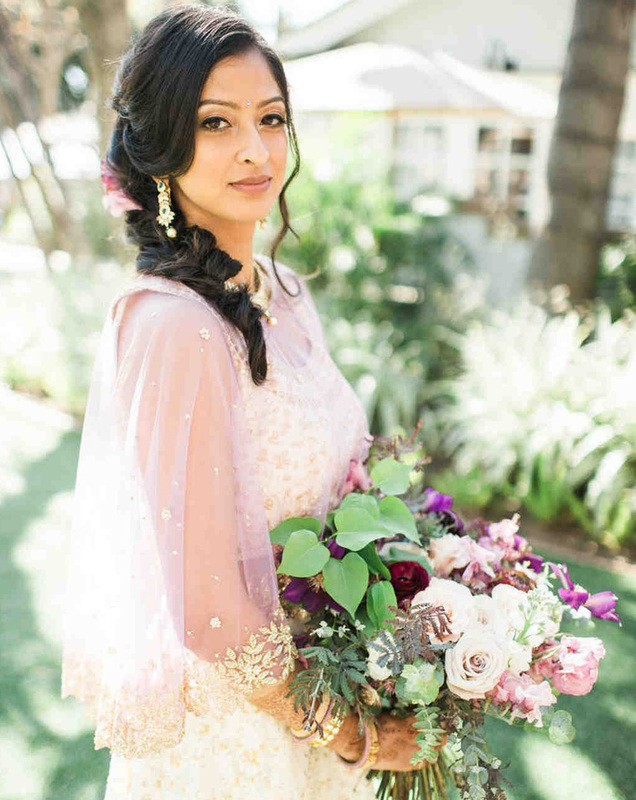 An ombré floral piece fit prettily into this bride's thick braid (by Kacee Geoffery) and referenced both her wedding sari and bouquet's color palette. Two sprigs of andromeda mimicked an oversized bar hair clip. 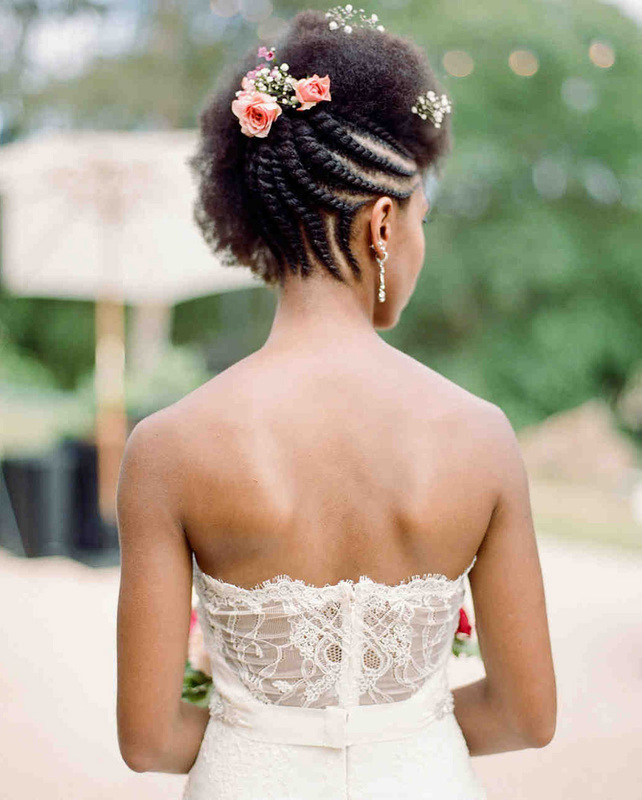 A pink ranunculus topper looked right at home on top of crisscrossed milk-maid braids. This bride rocked two major floral statements on her big day—a quarter-crown garden rose headpiece and matching rose bud ring. 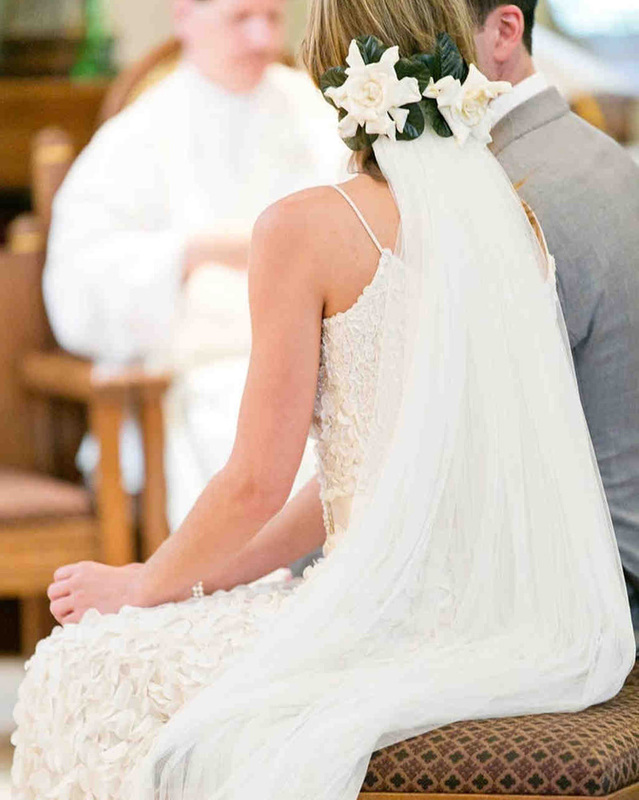 Two statement-making magnolia flowers bridged the gap between the bride's floor-length veil and her mane, which she wore in loose waves (styled by Ambiance Salon and Day Spa). Shooting greens gave an otherwise sleek updo a little bit of movement. Red astrantia provided a pretty color contrast to the leafy sprigs. This bride matched her tropical floral hair accents to her raspberry-hued lipstick. 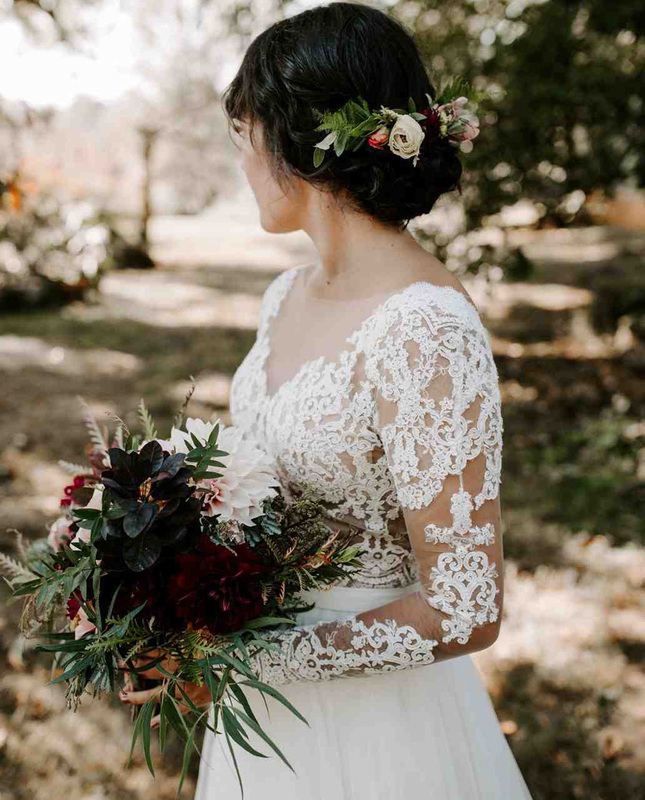 Gauzy flowers and beaded vines enhanced the effortless vibe of this wind-swept half-up, half-down style, courtesy of Jumeaux. Trista Clark of Crimson Rose Salon added andromeda sprigs to bring even more texture to this beauty's voluminous side braid. 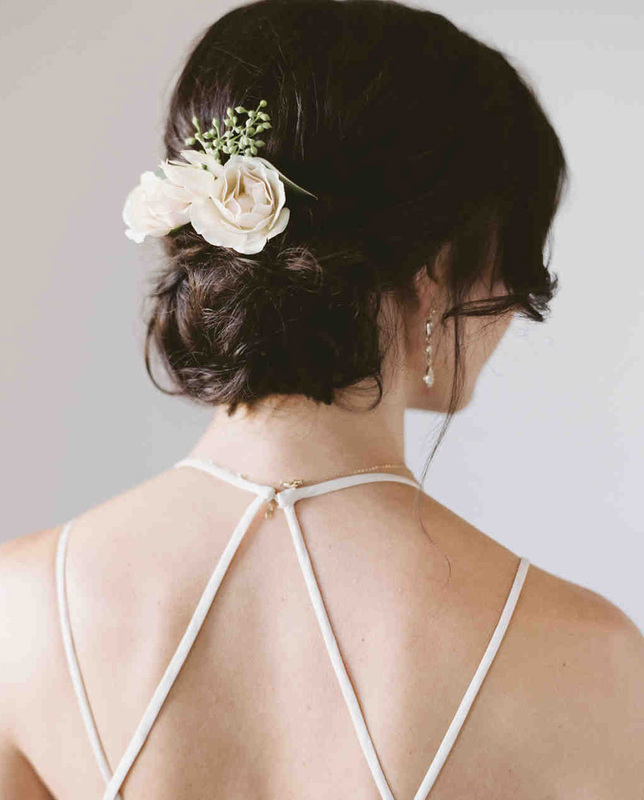 Two cream-colored roses were a fresh, traditional finishing touch for this popular bridal updo, by Sklya Arts. 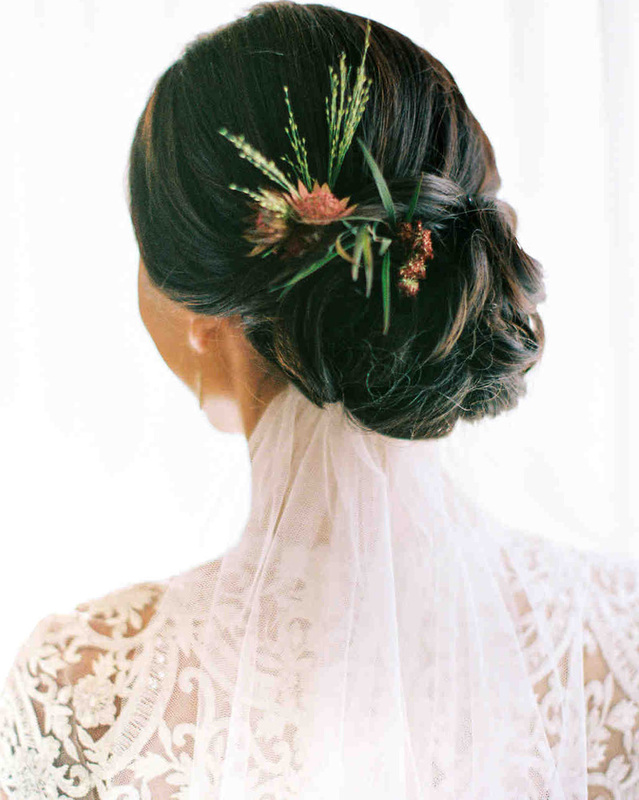 Identical peony and amaranthus blooms framed an open halo around the crown of this bride's head. 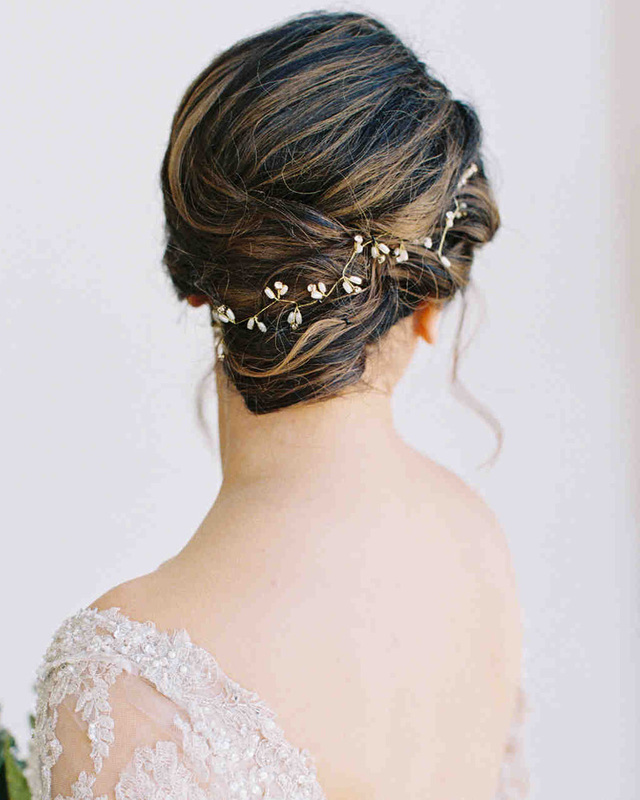 Stephanie of De La Mer Salon used crystal vines to add another layer to her bride's twist-meets-braid 'do. 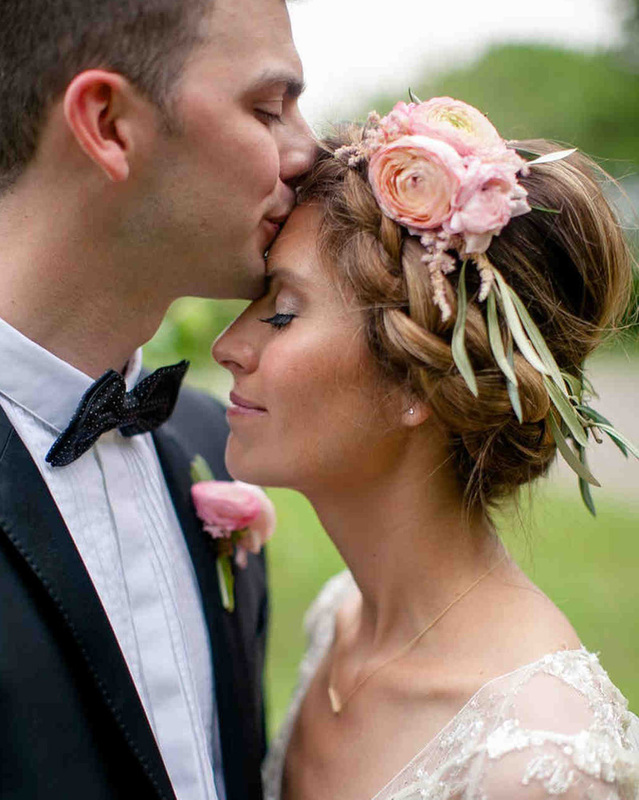 This bride took her floral headpiece as a chance to weave even more of her favorite flowers into her bridal beauty look. 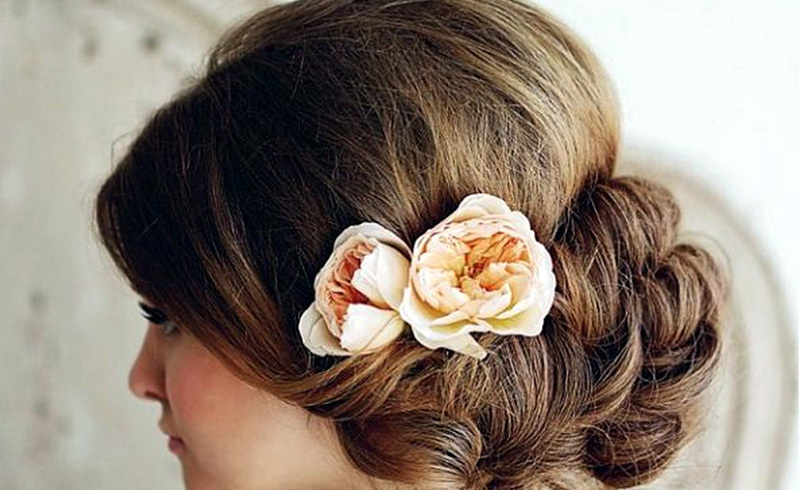 Her dahlia-centric bouquet paired prettily with the roses worn above her rolled updo. Chico Makeup Artistry used this pearly hair accent to mimic baby's breath (but it was infinitely more durable! ).